Today was my first real ride since my long training rides for Black Diamond, and the race itself. I’ve spent plenty of time on the trainer since then, but riding out in the elements is a completely different story. Somehow, I was spared from the rain during my 3 hours on the road today, but given that it was raining all night my trade was some serious skunk stripe, road grit that got through two layers of clothing, and both my bike and I needed a pressure washing session when we got home. With how great I felt on the bike just a month ago I assumed I’d still feel that good today. While I haven’t been putting in near as much saddle time I’ve been doing a significant amount of base fitness work, have added in weights, and consistently feel much stronger as a runner than I have since last winter. However I’m sad to report that my cycling didn’t live up to my mental hype today. There were some wins: I felt like I was spinning a lot more of the ride, rather than muscling through the uphills and riding the downhills. I willed myself to stay in the saddle up every hill (and it was HILLY! ), whereas usually I find myself standing up in the pedals for at least a few short stretches to keep my momentum up. I didn’t crash, which is a win today because wet pavement + crunched up leaves + hills + standing water + turns = wipeout city. I felt sort of badass battling the sideways wind around the east side of the lake and back across I-90, and even though I felt a little freaked about it I rode through it and conquered. But, it didn’t feel effortless. My mind went in to today viewing my ride as an easy confidence builder, hoping that upon hitting the last hill and mile I’d feel unfinished and wish there was more distance until home. Mentally I wanted to get out there, surprise myself with my own fitness, and spend the next 40 miles enjoying the swirling reds, oranges, and yellows of autumn. None of this was the case. It was hard, my legs burned, I beat myself up about why something so seemingly easy was a challenge, and then my legs burned some more no matter whether I was in the big ring or small one. To top it off, I overdressed and was drenched in sweat on this windy 50 degree day. I lost my water bottle on a bump and had to circle back to get it. And, 1 mile in I realized that my garmin mount was dangerously loose and my allen key was too short to reach down the tube to tighten it. So I watched it bounce around for 45 miles hoping that it wouldn’t fly off my aerobars and make me stop short. And then I got home and started to make my post ride pumpkin smoothie and realized we were out of bananas! FML. That’s the thing about the bike. There are so many factors outside of yourself that you have to learn to control as much as you can, but then let go of. Equipment and weather magnify the good (or bad) experience that you’re having, and can really make or break your day out there. Of course, you can’t prevent a flat, but I certainly could have checked my garmin mount before I headed around the lake. With running it’s you and your shoes, and the only thing stopping you is extreme ice, snow, cold. The swimming pool is the most controlled environment there is. During the summer I got so comfortable on the bike that I started feeling okay about the variables, and more confident that I could overcome them. I need to get back to that. I have a feeling this winter is going to be a challenge for me, but I need to get back in the saddle and become the Nemo of biking. Just. Keep. Pedaling! 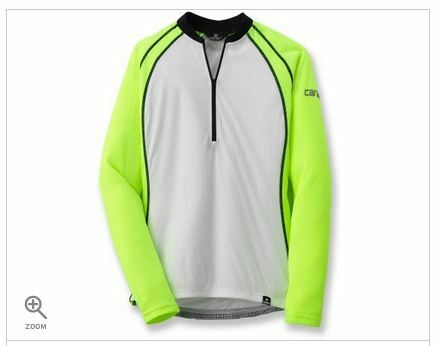 I don’t think anyone is going to miss me on the bike on these dreary mornings with my new blinky lights and this bright jersey! And it’s just as soft and cuddly as it is bright. Thanks REI sale!